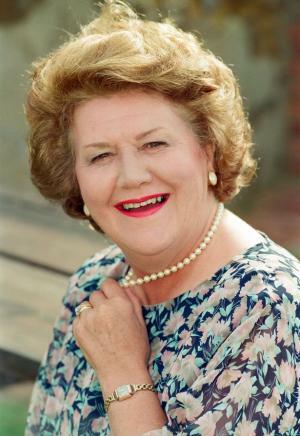 (Dame) Katherine Patricia Routledge was born on the 17th February 1929, in Birkenhead, Cheshire, England, and is an actress and singer, probably best recognized for starring in the role of Hyacinth Bucket in one of the most popular BBC’s sitcom “Keeping Up Appearances” (1990-1995). She is also known for her performances on stage, such as in “Darling Of The Day” (1968) and “Candide” (1988) among others. Her career was active from 1952 to 2003. So, have you ever wondered how rich Patricia Routledge is, as of mid-2017? According to authoritative sources, it has been estimated that the total size of Patricia’s net worth is over $2.5 million, accumulated through her successful involvement in the entertainment industry as a professional stage and screen actress. Another source is coming from her career on radio. Patricia Routledge was born to Catherine and Isaac Routledge, and didn’t have a very happy childhood as it was WWII happened, and she and her family were forced to live in the basement of her father’s shop. She finished Mersey Park Primary School and then matriculated from Brikenhead High School, where she started taking singing lessons and joined the school choir. Then she attended the University of Liverpool, where she studied English language and literature and hoped to pursue a career in education after graduation. However, she couldn’t totally abandon acting and singing, so she became engaged in the dramatic society’s activities at the university. There she met Edmund College, an academic who was also active at the society. He noticed her talent and convinced her to pursue an acting career instead. She accepted the advice, and wanting to get even better at the field, attended Bristol Old Vic Theatre School. Upon graduating, she joined the Liverpool Playhouse, and her acting career began in 1952, when she appeared in the play “A Midsummer Night’s Dream”. After a few months, they asked her to join the theatre as an employee. Because of her well-trained voice, she was often included in musicals and operettas, and also performed on “Broadway” in the 1960s, appearing in a number of famous plays such as “How’s The World Treating You?” (1965) and “Darling Of The Day” (1968). Subsequently, Patricia moved back to London, and she managed to make an extremely successful career in theatre and film, and on television as well as on radio. She became a regular member of the Royal Shakespeare Company (RSC), starring in such productions as “Richard III” (1983), after which she performed at yet another respectable theatre in London, West End, in plays such as “The Importance Of Being Ernest” (1999-2001), “The Solid Gold Cadillac” (2004), “An Ideal Husband” (2014), and many others, all of which added a considerable amount to her net worth. Speaking about her career on the big screen, Patricia made her debut appearance as a guest-star in the role of Alice Clay/Maggie Hobson in the TV series “ITV Play Of The Week” (1956-1966). Parallel with filming, she won the role of Sylvia Snape in another TV series entitled “Coronation Street” (1961), and three years later, she was cast as Queen Victoria in the TV mini-series “Victoria Regina”. During the 1960s, Patricia continued with guest-starring in other TV series, and soon she started to appear in such film titles as “Androcles And The Lion” (1967), “The Bliss Of Mrs. Blossom” (1968), and “Egghead’s Robot” (1970), all of which increased her net worth by a large margin. Her first big role in the next decade was the portrayal of Mrs. Jennings in the TV series “Sense And Sensibility” (1971), after which she was cast in “David Copperfield” (1974-1975), playing Mrs. Micawber, and in BBC TV’s mini-series “Nicholas Nickleby” (1977), as Madame Mantalini, increasing further her wealth. In the forthcoming years, Patricia also appeared in film titles, including the role of Ruth in “The Pirates Of Penzance” (1980), portraying Madame Multitude in “The Two Ronnies”, and as Ivy in the 1989 film “First And Last”. To speak further about her acting career, in 1990, Patricia won the role of Hyacinth in the TV series “Keeping Up Appearances” (1990-1995), which became one of the most popular comedies at the time, increasing her net worth a lot. When the filming was over, she was selected to play the title role in the drama TV series “Hetty Wainthropp Investigates” (1996-1998). Her last appearance was in the 2003 film “In Search Of The Brontës”. Moreover, Patricia was also heard in several radio plays, including “Romeo And Juliet”, “Alice In Wonderland”, “Private Lives”, and a lot of others. She was engaged to recording several audiobooks too. among which are “Wuthering Heights” and “Alice’s Adventures In Wonderland”. This also had an influence on her net worth. Thanks to her accomplishments, Patricia was nominated for and won a number of prestigious awards, including a Tony for Best Actress in a Musical for her work on “Darling Of The Day” in 1968, the 1988 Olivier for Best Actress in a Musical for her work on “Candide”, and she was nominated for the 1992 BAFTA TV Award for Best Light Entertainment Performance for “Keeping Up Appearances”. Regarding Patricia Routledge’s personal life, there is no information about it in the media, except that she has never been married and has no children. Her current residence is in Chichester, West Sussex, England. 1 [on her character Hyacinth Bucket] The basic premise of Hyacinth is pretension and that's the source of so much comedy. While attempting to be a social climber, she also had to deal with members from the other side of her family like Onslow, who sat around in his string vest drinking beer. In a way, the show was a microcosm for society. 2 [on the cancellation of Hetty Wainthropp Investigates (1996)] We were betrayed by the BBC. We finished series four of Hetty Wainthropp, we were told there was going to be series five. But no word ever came - how rude! The BBC is run by 10-year-old children. 3 [on quitting Keeping Up Appearances (1990)] I decided to part company with Hyacinth because there were other adventures to have. I'm an actor and I like to play other roles. 4 [on Alastair Sim] There lives and breathes a comic genius of gargantuan proportions. 5 People have always pitied spinsters. We have been derided, as if we had missed out on life. Well, we need not miss out on anything today! 6 I just want to do good work with good people in good places. And as for retirement, I can hardly spell the word. I'm driven, really. The demons won't lie down. 7 When I approach the pearly gates, I'd like to hear a champagne cork popping, an orchestra tuning up, and the sound of my mother laughing. 8 I don't think you can go it alone. There is a positive force for good outside oneself, call it God if you like, that has the strength to turn darkness into light. 9 There is nothing like that audience response when it's working with you - nothing. 10 On acting: "I was fully alive and it frightened me. I was in a tremendous turmoil about it." 1 Sister of Reverend Canon Graham Routledge (born Kenneth Graham Routledge 1927, died 18 May 1989) and Edgar Routledge (born Edgar H Routledge 1926, died 1926). 2 Daughter of Isaac Edgar Routledge (born 1898, died 1986) and Catherine Routledge (born Catherine Perry in 1900) who married in 1925. 3 Played 'Dame Laurentia McLachan' in 'The Best of Friends' at the Hampstead Theatre, London, UK in 2006. 4 Starred in "The Importance of Being Earnest" in London in 1999. 5 Appeared in a play called "Best of Friends", at the Hampsted Theatre, London (in 2006), about George Bernard Shaw, a Museum Curator and a Mother Abbess (Routledge). 6 Last name is pronounced as spelled, Rout-ledge. Not Rut-ledge. 7 She was awarded Broadway's 1968 Tony Award as Best Actress (Musical) for "Darling of the Day in a tie with Leslie Uggams for "Hallelujah, Baby!". 8 She was awarded the CBE (Commander of the Order of the British Empire) in the 2004 Queen's Birthday Honours List for her services to Drama. 9 She was awarded the Laurence Olivier Theatre Award in 1989 (1988 season) for Best Actress in a Musical for "Candide". 10 She was awarded honorary Doctor of Letters in 1999 from her alma mater, the University of Liverpool in Liverpool, Merseyside, England. 11 She credited the late Catholic priest Father Edmund Colledge for her entry into the performing arts, according to the Times of London in the late Father's obituary. 12 She graduated from the all girls Birkenhead High Girls Public Day School Trust in Birkenhead, England. 13 She gave a classic performance as Mrs. Malaprop in "The Rivals" on the London stage. 15 She was awarded the OBE (Officer of the Order of the British Empire) in the 1993 Queen's Birthday Honours List for her services to drama. 16 Named as the Personality of the Year in 1993 by the Variety Club of Great Britain. 18 Named as the Top Television Comedy Actress for 1991.